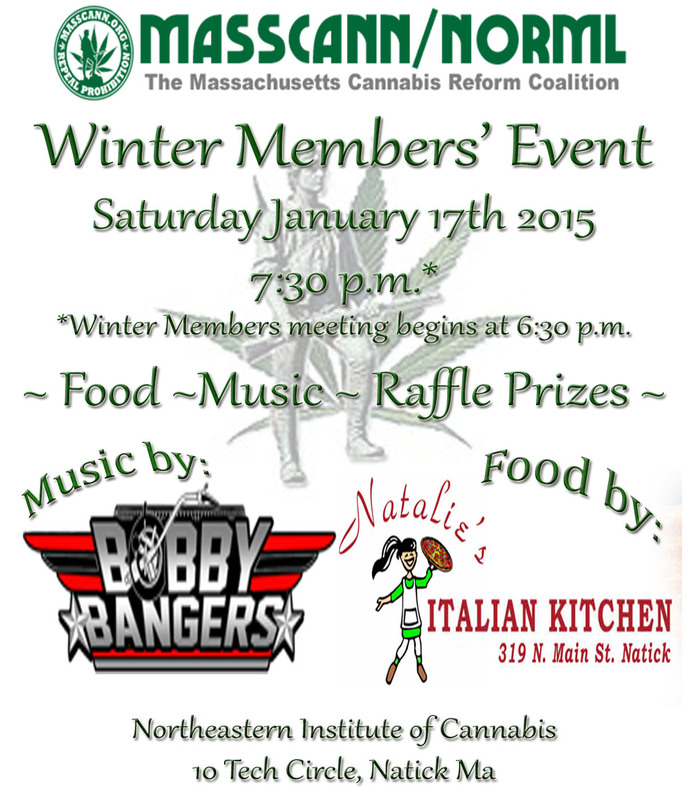 MASS CANN/NORML presents our Winter Members’ event! Saturday, January 17th at Northeastern Cannabis Institute, 10 Tech Circle, Natick Ma. A members’ meeting will take place at 6:30 p.m. for current members. Our event featuring food, music, raffle prizes and more, will be open to general public at 7:30 pm. Suggested donations to be collected at the door: $30 non-members, $10 current members OR $25 new member special! ($25 member special includes entrance to the event PLUS MASS CANN member t-shirt and voting rights for one year). MASS CANN is a non-profit organization run off the strength of our members, contributors and volunteers. We need YOU to help reform marijuana laws and bring legalization to Massachusetts! More details to be posted closer to event date.